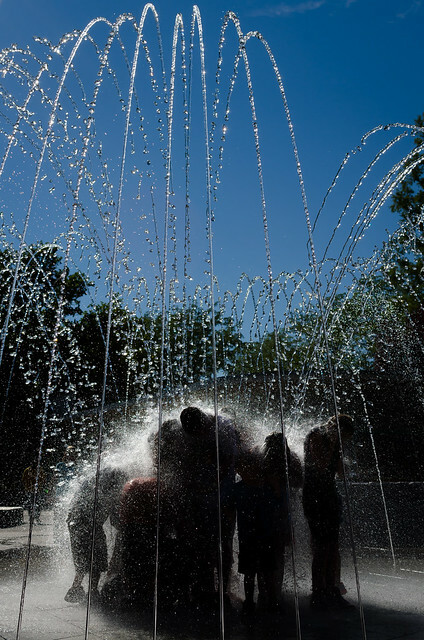 While enduring triple-digit temps at the amusement park on Monday, I walked past this scene just as the fountain shut off. I knew it would be a good photo op so I set up to catch the action the next time the fountain started. I only had my 35mm prime for the day, so I couldn’t rely on any zoom capability for the composition. I was careful not to cut off the arc of the water at the top of the frame, cranked the shutter speed very high to freeze the individual drops, and fired off the shot – knowing the backlit water spray would make it a keeper. Posted on July 14, 2012, in photography and tagged Friday Foto. Bookmark the permalink. Leave a comment.